What does an American Business Systems Business Opportunity Cost? The cost to become a American Business Systems owner is a one time payment to purchase the Training and Support Business Package. The total investment of the American Business Systems Medical Billing Training and Support Business Package is $26,990. This investment includes software and services, training, and lifetime support. American Business Systems is also the only medical billing company to offer a 100% money back guarantee during training. 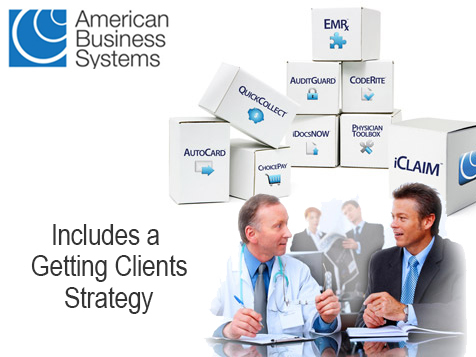 American Business Systems- The fastest way to start your medical billing business. State-of-the-art, web-based electronic billing. All the codes and HIPAA compliance features are built into the system. All the updates are installed automatically, ready for you to use when you log on. There’s no extra cost for upgrades, ever. You aren’t tied down to the office, because you can do your work online from any computer with an Internet connection. The site is secure and encrypted data is backed up daily. Solve the doctors’ cash-flow problems, not just file their claims. Doctors often don’t get paid for 60, 90 or 120 days. And the average rejected claims rate is about 30%. Our system gets payments into the doctors’ hands within 7-10 days - with a dramatically reduced rejection rate of just 2%. Turnkey marketing system. Our proven system brings prospects to you. You’ll receive a supply of professionally designed brochures, CDs, faxes, letters and postcards. As an ABS licensee, you’ll also get our exclusive ABS Practice Analysis Tool that shows doctors how much they can save with your services compared to their current billing system. Flexibility- You can work from anywhere and set your own schedule. Build a part-time business to earn extra income, replace your salary, or grow the business as large as you want. Growth potential- According to the U.S. Bureau of Labor forecast, health services are in the #1 “super sector” for growth. Plus, people continue to visit doctors whether the economy is up or down, and 80 million “baby boomers” will be retiring in the next few years, so timing couldn’t be better for this industry. No special education required. You don’t need any special degrees or professional licenses to be a medical biller. Learning complex billing codes is not required. Training: A complete training course is conducted by trainers who are active in the medical billing business. Plus, you also get complete DVD training, work books and ongoing educational webinars. Lifetime Support: We are dedicated to your success. You will have one-on-one support from our Success Team for life to help you as you get started, and any time you have a question. “The ABS system is ready to go. You operate based on their proven business model; there is no comparison to starting a business on your own. They train you to perform medical billing and related medical practice management services…I didn’t know anything about medical billing before going to Franchise.com…and in a short period of time I’ve been able to get my business going. 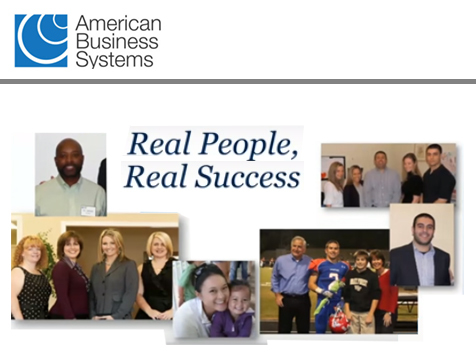 “I haven’t felt a downturn due to the current economic conditions…There are other businesses closing left and right, but my business continues to grow…ABS supplies everything you need- the products, services, support and training are all provided, it’s just a matter of your determination to make it work. This opportunity is available in the United States only. When you submit your information, you’ll receive details about our Free One-hour Webinar (online presentation).